This device offers a variety of options both for beginners and experienced musicians. 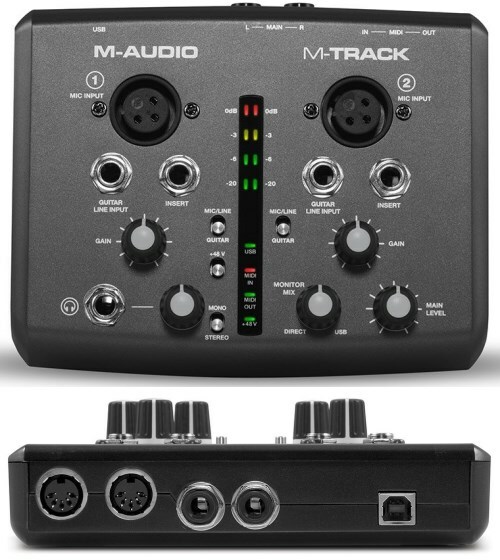 M-Track also comes with a balanced XLR microphone input and balanced 1/4" line inputs on each channel. There is switchable 48V phantom power on every mic input that can be used for your favorite condenser mic, and there is also a balanced line input that can be used to connect a variety of equipment such as a drum machine or keyboard workstation. You also will find a guitar switch on each line input, and if it is connected, it can change the normal input impedance to Hi-Z. This way, you can connect your guitar directly into the interface for recording and processing. It is compatible with virtually all music production software, it also includes free copies of Ignite by AIR and Ableton Live Lite. M-Track Audio Interface Series combines a powerful feature set with a very easy to use to create a versatile audio / MIDI interface for any level of musician. Its discrete preamp design and professional audio converter can deliver up to 24-bit, 48 kHz digital audio for use with any software. It also has 4-segment LED metering and multiple status lights to provide real-time visual feedback. With its simple control system, effective metering and a rugged chassis, the M-Track is suitable for everyday use. M-Track also has a reliable platform, so a variety of devices in a project studio can be accommodated properly. The input channel at M-track also comes with insert jack, this will allow the use of studio-grade effects with input sources while recording. Both through the speakers and headphones, M-Track also offer ultra-low latency monitoring of the input signal. With monitor mix knob, you can adjust the balance between direct input and playback from your computer software. You can also monitor the input signal in stereo or mono by using the Stereo / Mono switch, this will make it easier to record new parts or add parts to the previous composition. There are also MIDI In and Out jacks on M-Track to support 16 channels of MIDI data and timing information. And another great thing about M-Track is, it includes Ignite music software that will enable you to capture, combine, and arrange your musical ideas easily. Phantom power plus guitar-level switching ( accommodates any audio source ). Insert jack on each channel ( incorporate your favorite effects ). Supports 16 channels of MIDI data and timing information. Includes AIR Ignite and Ableton Live Lite. Small, flexible, and easy to use. Solid, a well built piece of hardware. Real time monitor works quite well. No ASIO or S/PDIF support. It is not class compliant Windows 8, however most people find it does work once you download the latest drivers. Although the list price is $149.95, most online retailers are selling it for just under $100 and the M-Track is currently out-selling all other USB audio interfaces in this price range because it's great for personal use and recording demos at home.